"Homemade" Asian peanut-sesame dressing tastes good on pretty much anything, even randomly heaped vegetables from the dining hall salad bar. We’re lucky that Brown’s cafeteria, the Ratty, has quite the internationally stocked condiments counter – with spices ranging from curry powder to ground ginger it’s almost as if the Ratty is begging students to experiment with “homemade” flavor enhancements. Yes, it will take a little longer to prepare such an awesome dining hall meal, and yes, you do have to mix it up the dressing and toss the salad by hand, but we promise it will be worth every drop. 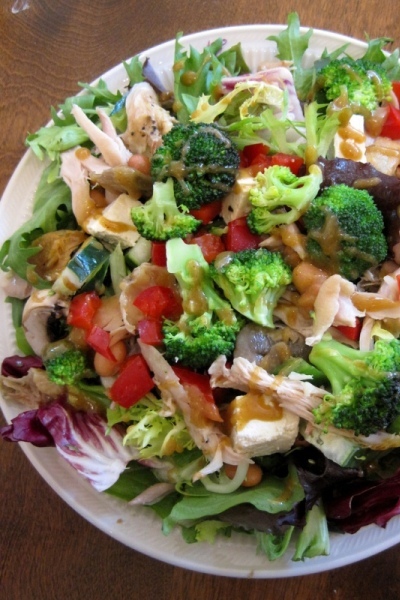 Combine all of the salad ingredients on a plate, drizzle Asian Peanut-Sesame Dressing generously over the top, and enjoy. Combine all ingredients in a cup and whisk vigorously with a fork until emulsified, about 1 minute.